The fear of accepting refugees because they might repeat the Paris attacks doesn’t make sense to me. Fanning the flames of fear is an easy way to promote policies that let the powerful increase their power. We have a fear of terrorists from the Middle East, but the fear mongers forget the terrorist incidents in the U. S. with American perpetrators. There is a long list of shooters in this country who have killed multiple victims. People apparently don’t remember the university shootings this fall, let alone the Charleston Church Massacre, Virginia Tech and many others. Colorado Springs has seen two separate multiple fatality shootings within a month. Now, Sandy Hook is part of the American legacy of violence. There’s no evidence that there won’t be more attacks by Americans on Americans. Opposing refugees by promoting fear is a low-cost, highly effective way of winning political points with people who already are afraid of “them.” Who “they” are changes from decade to decade. When we fear “them”, we help destroy freedom in the name of freedom. The beauty pageant circus that’s the current presidential race is really mindless in what it wants to focus on. The real problems that face our country are ignored while we talk about who “won” the last debate and which candidate is having a tiff with which other candidate this week. There are lots of more useful things to talk about–perennial topics that none of the candidates want to touch. * What is the ethical approach to the needs of the American’s who are working and have trouble paying grocery bills and rent at the same time? * What are we willing to do to protect our environment? What does the environment need from us? * Is it morally right that the wealthy can get the best medical care while those less fortunate don’t have the opportunities to recover from a serious illness? * What is our responsibility towards the homeless and mentally ill? Do we have a moral imperative to respond to their suffering? * Are we willing to sacrifice our privacy and freedoms because of fear? The news media has appropriated the word “ethics” to mean “Did a public figure do something shady that will help me sell more advertising?” Ethics means the rules of conduct one applies to oneself. It isn’t about the other person or what the ethics committee wants to sanction. It’s about what I’m willing to do or not do in each area of my life. Since Ben Carson is the front runner in the Republican presidential race right now, I want to imagine, based on his current behavior, how will he act as president. This kind of defense is successful because many political conservatives have talked up the motif that the media is liberal and that it can’t be trusted at all. It has been said enough times that people believe it. This is really dangerous. If you don’t believe anything that the news media presents, then there are no resources to ask difficult questions to the people in power. It’s a good thing that that argument didn’t work for Nixon and Spiro Agnew. The media was asking difficult questions about their actions. The media was not saying what they wanted to hear. It seems that, if Nixon were in office now, he could just shout down the media, and he would have stayed in office. I recently joined meetup.com I found out about a drop-in every Thursday at TekVenture http://tekventure.org in Fort Wayne. When I was at tekventure there were a couple of other people who found out about the drop-in the same way. I went once, but it conflicts with Toastmasters so I won’t go much. However, I got an event schedule at TekVenture and found there’s a workshop tomorrow morning that I’m going to. Our district of Toastmasters has a meetup.com group also. I get notified of all of the different Toastmaster group meetings that are coming up. I’m looking forward to going to some other groups in the area this coming week. The club that I belong to, Anthony Wayne Toastmasters, was chartered in 1947. I was toastmaster last night and introduced the speakers, general evaluator and the topic master. (The general evaluator organizes the feedback parts of the meeting. The topic master has impromptu topics to ask so that everyone gets a chance to participate.) The group is really supportive and wants me to succeed (like everyone else). Last week I gave a speech about Open Source Hardware. It was lots of fun. The PowerPoint came out well. I had fun using gimp to put together the images. A long, long time ago, I had the idea to hold a sesquiannual party. I never set one up. It would just be too hard to remember when the next one is supposed to happen in 18 months. Since that time I’ve used sesqui* for all sorts of things. My deviantArt user name is sesquicentennial. I use derivatives of sesqui for user names all over the place. My stamp collection includes pictorial postmarks celebrating sesquicentennials. The offensive material was added by an IP: if it was you, please don’t do it again; if it was friends, please discourage them; if it was just random vandalism, never mind, but please keep an eye on your user page in case the vandal returns.” [edit: The bad content was old. Maybe someone was doing me a favor and reported it]. I know that xkcd is really popular. I like it too, but it may have its share of trolls, like anywhere. One of the consequences of Munroe’s popularity it is that when he mentions a page, it gets inundated with traffic. He can refer to a video and it receives a huge number of hits pretty quickly. 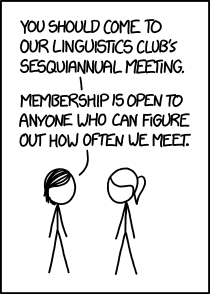 I thought it was funny last night when I saw the sesquiannual xkcd post. I thought I hadn’t used it anywhere to demo that I came up with it first, but there it is on wikipedia.